We have a fascination with writers who draw from place. It is probably something to do with the fact that as walkers we are out carving our way through space and experiencing places, one step at a time. We are not great writers so appreciate those who can write a good story and engage with readers. 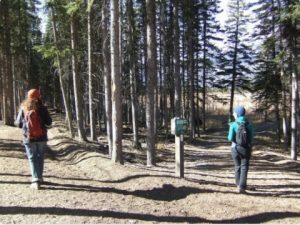 We wanted to read more writing from such writers and create experiences on foot, to which we could invite others to discover that writing, as well as exploring places. In addition, we wanted to generate discussion about the writer and their creative process too. So we can be walking with others, sharing stories from engaging writers, we have devised “Walking: Between the Lines”, and we hope you will come and join us – choosing to read the writing that we are reading too – a Book Club on foot. Part discovery of engaging writing, part discovery of place, and part discovery of the writer. We are starting out on this new adventure in November 2018, running an event once a month. As it is the centenary of the birth of Dame Muriel Spark, we though it was only right that we should invite you on an adventure to discover Peckham in the 1950s – the setting for her novel “The Ballad of Peckham Rye“. Written when Muriel Spark was living in nearby Camberwell, it was published a year before “The Prime of Miss Jean Brodie” – by far her most famous novel, because of the play starring Vanessa Redgrave, and the film starring Maggie Smith. Muriel Spark led quite a colourful life herself, living in Africa during the Second World War, abandoning her son in leaving a troubled marriage, she was ‘discovered’ by winning a short story competition. What followed was a string of slim novels, far from lightweight however, many drawing on her life experiences and the places she lived. Latterly she lived with a female companion in New York and then Italy. The Centenary is marked by a slew of events, many of which have already passed, but there’s a fabulous website, MurielSpark100 listing on-line resources worth a dip into. 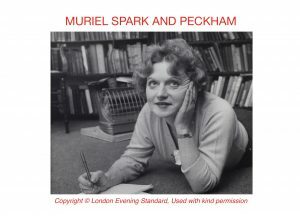 Come and join us, in the company of Dame Muriel Spark as we reveal Peckham in the 1950s from 2.30pm-4.30pm on Sunday 4 November – read more and book here – and remember to read “The Ballad of Packham Rye” beforehand! We are open to suggestions on writing and writers who draw from place, so if there is hero or heroine of your’s with whom you would like to go Walking: Between the Lines – just use our Get in touch page and we will try to schedule a walkshop, convenient for you. 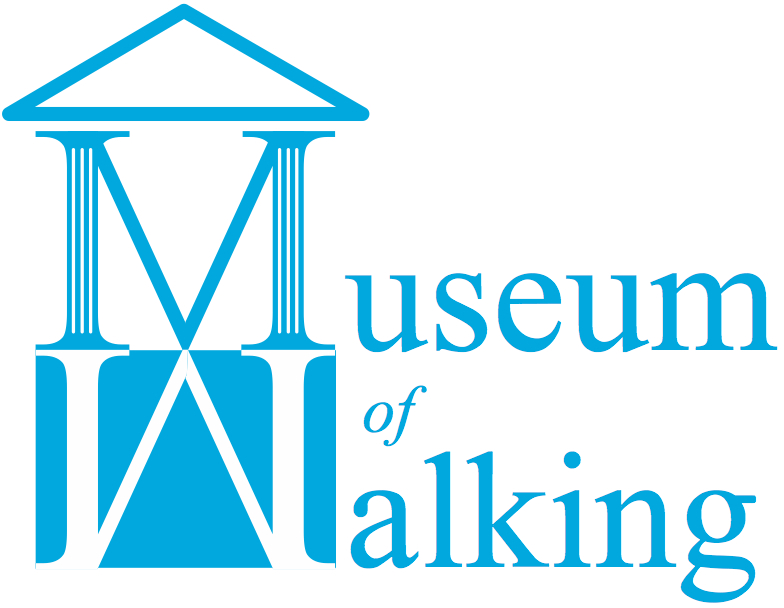 Continuing our saunter through the podcast library of interviews we have recorded for Talking Walking, this last week, we have been hearing from people who seek to make the walking environment better, as well as those who have been trying to get us to be more active. Some of the interviewees are no longer in the roles they were when we recorded them. Some of the organisations still continue, others have disappeared but it is interesting to hear their enthusiasm and passion for inviting people to experience the outdoors in a different way. It was great to contrast the views of Bill Chandler, the convenor of Australia’s Urban Design Forum with those of Robert Huxford, Director of the UK’s Urban Design Group. For Australians, where their roads are wider, and suburbia more sprawled, the key was about making the first part of every journey by whatever mode, more pleasant for walking – this chimed too with what Des de Moor, formerly Everyday Walking officer at the Ramblers had told us too. For Robert Huxford, traffic speed was a key determinant of whether people chose to walk, with Tony Armstrong, the then CEO of Living Streets suggesting that the pier to change the built environment was squarely on the shoulders of local authorities. By the time I interviewed Veronica Reynolds of now defunct WalkEngland, health walking had become firmly established with more than 500 local initiatives across the country. Aspirations were about getting people to test their levels of fitness through walking 1 mile Active Challenge routes with a target of getting 1 million people more active by the Olympics. It was delightful to listen again to two artist curators who interpreted different landscapes through walking, first Sorrel Muggridge (in collaboration with Canadian artist Laura Nanni) recounting how ‘retelling a route eroded its distance’ and how they created a 3D ‘infographic’ of their repetitive endurance walking by rolling up climbing rope. Second, Martin Kohler, a professor of urban planning and photographer, who has been part of a team who conceived the Haffen City Harbour Art Safari, in which they invited people to explore and ‘uncover’ art installations in derelict (but soon to be developed) docklands, declaring that such landscapes are ‘lived in through dreams and memories’ and that these are as important as the infrastructure that persists. Last but not least this week, we ran a Hidden Garden Haiku walkshop in Vauxhall to celebrate National Poetry Day – here are a couple of the haiku written for you to enjoy and you can download a zine anthology of poems from the walkshop from the event page here (there’s also a handy crib on how to fold the paper on which you print them). 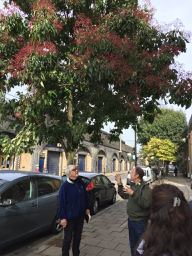 It has emboldened us to set up a monthly Hidden Garden Haiku each Thursday – next up is City East, in which we will visit a garden within a derelict church, a labyrinth in a courtyard and the churchyard where Samuel Pepys is buried. Come and join us – it will be fun! This entry was posted in Uncategorized on October 11, 2018 by admin_MoW.